Finding Dory is all the rage in our household now that we have seen the new movie. My daughter’s Finding Dory Party was a big hit with her and her friends! 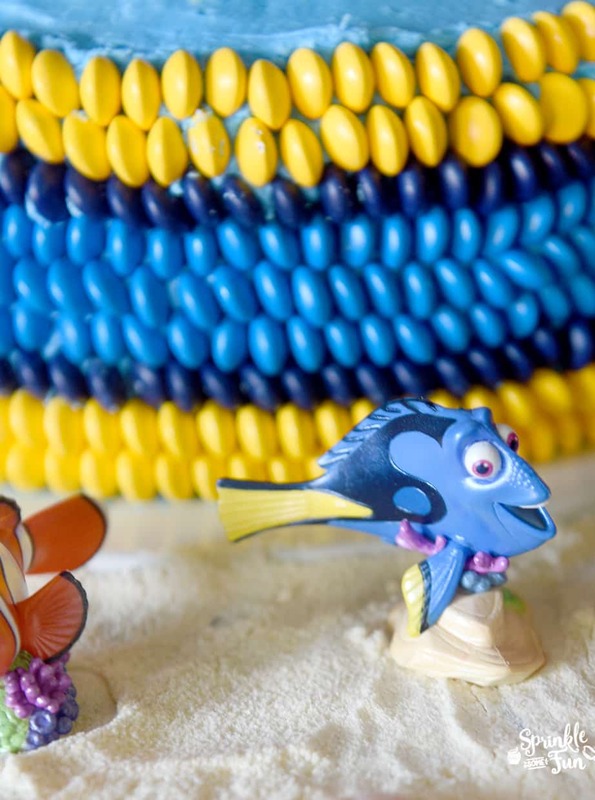 You can see all the details of her Finding Dory party on this post. 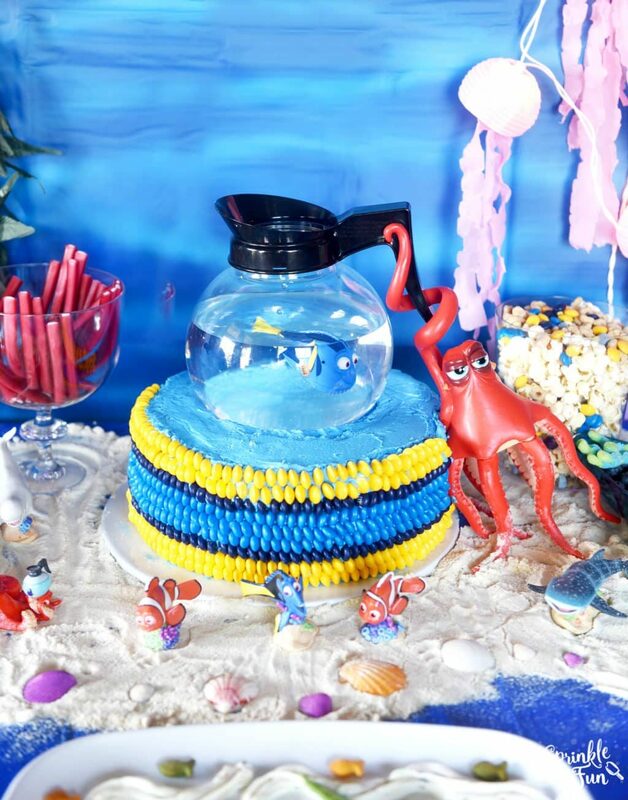 This Finding Dory Cake was one of my favorite things! It’s based off of the scene where Dory meets Hank the “septipus” and he scoops her up into a coffeepot. 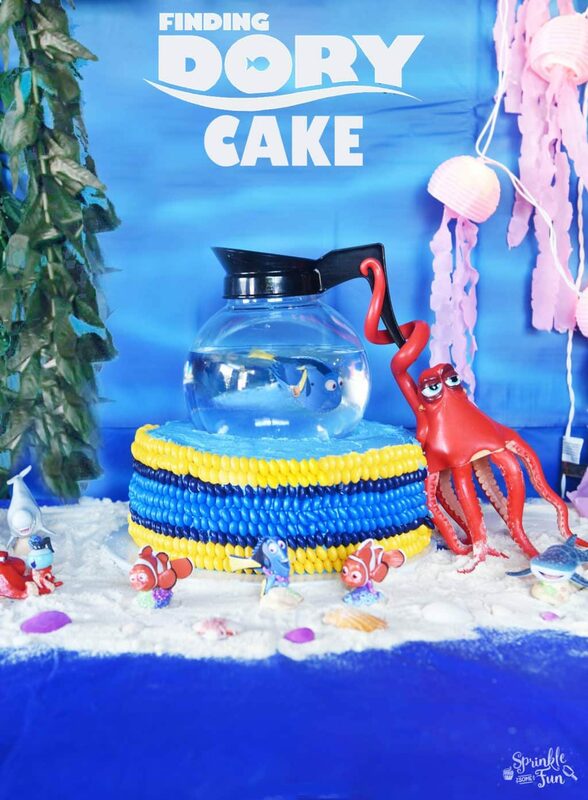 When we found the Finding Dory Coffeepot toy I knew I had to create a cake with it! 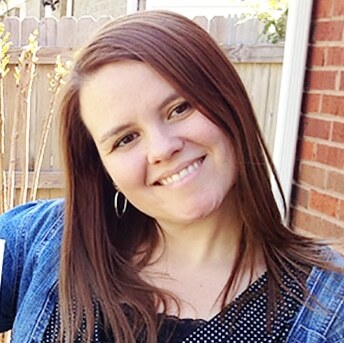 There are affiliate links in this post to support this site. It’s made out of plastic so it’s very lightweight on its own, but once you add water it’s over 4 pounds! I had to use dowel rods to keep it in place and even then I didn’t add enough. I ended up using 6 dowel rods, but in hindsight I should have just use some play dough or icing to keep her upright in the pot without the water. You can use it with or without the water added, but just be aware that you’ll need a lot of support to hold it up with the water. There is also this really cute Finding Dory coffee mug that would work, but it’s much smaller. For Hank I used this Hank water squirter and sawed off the plastic tubing by taking Han apart and then gluing him back together. You can make the cake with or without this Hank. There are other Hank toys on the market. I used m&m candies around the sides of the cake. I think it resembles fish scales. To assemble the cake I used a 10 inch cake that was double layered to around 4 inches high. I added the candies in rows and each candy was on its side instead of the flat side out. It’s an easy decoration idea and you don’t have to worry about smoothing out the icing as much. Just make sure that you have around 1/4 of an inch icing in thickness so that there is plenty of icing for the chocolates to stick into.